In this article, we’ll look at all sorts of improvised and inexpensive means for making acoustic arrangements for a sound recording studio. I remember my room, with bare concrete walls, in which I once asked myself a similar question, and then I went to the grocery market to the department, where trays with chicken eggs were sold. They were not necessary to me, but the cardboard cells in which they were stored and were my goal. Having counted the number of cells by the area, I took the necessary, and we began to build a wallpaper glue and glue the cells with a friend. If anyone decides to do the same, I will say that the wallpaper glue of the cell is bad to glue; they immediately after gluing constantly strive to fall off, so they have to prop up something. (True, then, when dry, do not tear off :), but it’s best to glue them on liquid nails. (Incidentally, an interesting feeling of being in a room with cells pasted on the walls… somehow favorably affects such a “volumetric” surface of the walls on the brain). Already at the stage of the glued cells, clapping hands sounded convincingly – 1 time, deafly. Someone might ask: how can cardboard cells absorb sound? No way. They do not absorb it, absorb it with nothing. But they can disperse it well, i.e. reflect not in one direction, but in different. This is not an ideal option, but in this way, you can already get rid of many resonance frequencies in the sound spectrum. From many, but not from all. Some low frequencies will still create resonance. Significantly improve the situation in this case will help hanging directly on top of the cells curtains. They are made of special thick, thick and heavy fabric. The sound, partially penetrating into the tissue, enters the acoustic layer, where, due to the shape of the cells, it dissipates from the inside and, being reflected, is again absorbed by the tissue. This is an improved version of the previous one. Of course, if carpets are hung on the walls, then this is a very good natural sound absorber. In general, any objects: soft, complex geometric shapes are a natural obstacle to direct reflection of sound (acoustic) waves. It is very good, if in a room (premise) instead of usual windows plastic windows are established. It is the perfect absorber of external sounds coming from the street. And at loud low frequencies, they will not rattle like ordinary glasses in frames. The very same window is better to curtain the blind, curtained curtains, the type described above. They will not let the sound from the smooth, hard surface of the glass be reflected. For a floor covering natural, a logical variant is a usual carpet. Carpet is relatively inexpensive and quite satisfactory in terms of acoustic (more precisely anti-acoustical) properties of the floor. In general, carpet, in this case, is ideal for walls, as a universal sound-absorbing coating. If the surface of the door in the room is firm and smooth, then find a piece of carpet and for it and beat. 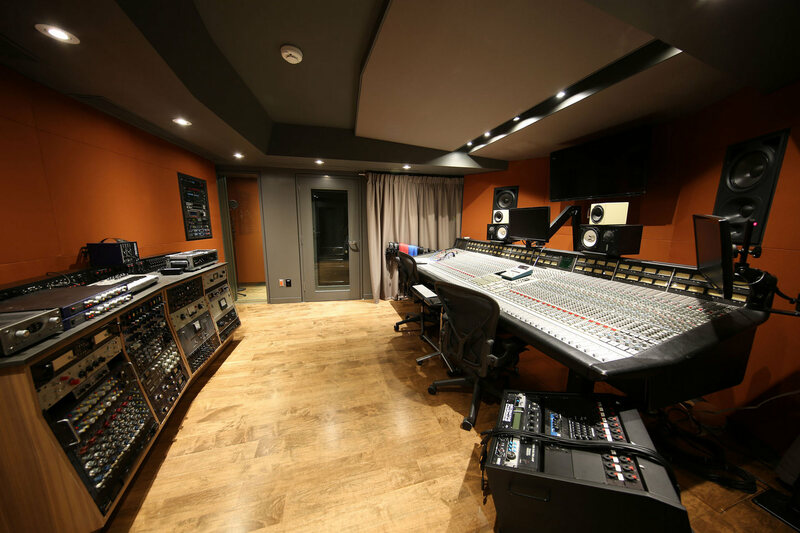 This is all about the general acoustic finishing of the room under the recording studio. In the future studio, probably, there will be guitar combo amplifiers, which are usually on the floor. The sound will naturally spread, basically at the same level (from below), therefore, it would be desirable to take care that it is not, too actively, there spread and build something like a mat to place it around the perimeter or opposite and behind in the form of acoustic shields. Once I used the primitive idea of a sound absorbing sound, soon after gluing cells, I went to the building store to buy a roll of isover – a special heat and sound insulator consisting of glass wool. In the same store I bought a large, long polyethylene bag, just the size of the rolled up isover roll, where we invested the whole isover, and the ends of the bag were sealed. As a result, the bottom of the perimeter of the room was trimmed with such an improvised sound-absorbing mat. But of course, it will not save you from a live drum set (although I had an acoustic drum set there) in a residential 12-storey candle, almost on the 5th floor… everyone was happy, especially grandmothers. 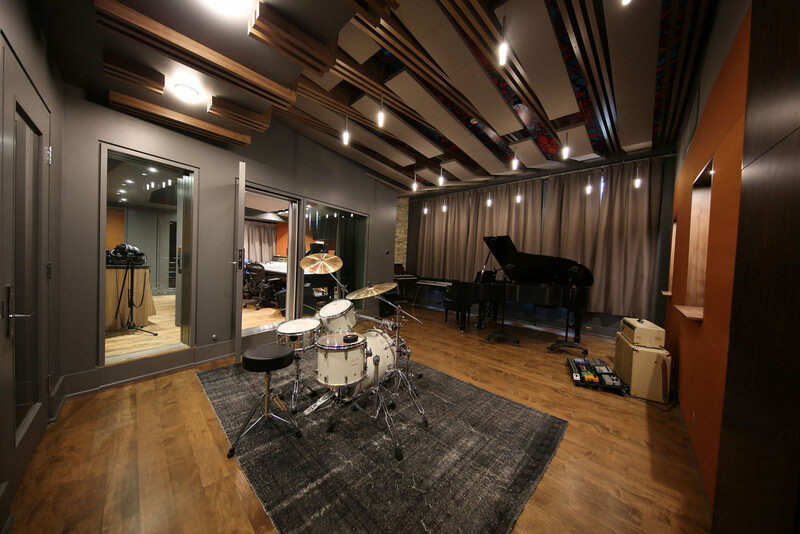 For a live drum set, if you are going to create a music studio in an apartment building, special measures are needed. For example, building a special frame with walls – such a large box, which could fit the entire drum set with the drummer, plus a bit of air so that it does not choke there and a few microphone racks (we suggest that the skeleton will be covered from all sides). The whole inner surface of this mini-room should be covered with cotton mattresses. The floor can be lined with wooden boards, and on it to throw a rubber sheet. Apparently, it is necessary to provide a door, so that through it the largest parts of the drum set can pass without difficulty. And do not forget as much about how convenient it will be to communicate microphones with the sound recording part of the studio. Thus, the resulting “house” can be placed under the ceiling on four bases of the appropriate length and strength, under which, as well as put pieces of thick rubber. For your information: there is such a collapsible professional solution with noise suppression level of -60 dB. (very expensive). But this is a “heavy” drum version. If your claims to the live acoustic sound of the drums are not so great, then it’s enough to build a small wooden pedestal, cover it with carpet and place on it a drum MIDI setup (and not to torment the drummer). It would be advisable to build a small plywood screen, for example from four flaps (naturally clogged with a sound-absorbing material, for example a carpet) that could be easily moved and easily transformed into a necessary shape, for example, in the form of a booth where the vocalist recorded a voice, and extraneous noise for him would be minimal.